Patricia Delinois, CDPE, NSFA, TRC, CSES, founder and CEO of Century 21 Premier Elite Realty, announced the opening of her company’s new office, located at 13827 South Dixie Hwy. Palmetto Bay, FL 33176 . “Miami is quickly transforming into a new global city keeping our agents busy with the increasing demand from our foreign buyers looking for stable safe real estate investments. Our international buyers find Miami as an affordable option with tremendous opportunity” said Patricia Delinois, President Century 21 Premier Elite Realty. CENTURY 21 enjoys the highest brand awareness compared to any other real estate organization in the world. Our award-winning website averages over 2.7 million visits each month and our global network of members and affiliates is the key with over 143,000 real estate service professionals in 8,000 offices in over 60 countries worldwide. “This expansion allows us to offer homebuyers and sellers an increased level of service and convenience in their real estate transaction needs,” said Patricia Delinois. The firm also has offices in Coral Gables and Miami Beach, with a total of 175 associates in Miami-Dade County. 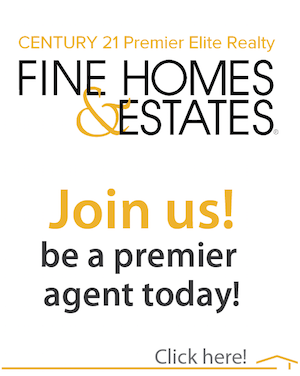 CENTURY 21 Premier Elite Realty is a strong full-service real estate brokerage company with offices at 2755 Collins Avenue in Miami Beach, FL 33140, 393 Aragon Ave in Coral Gables, FL 33134 and 13827 South Dixie Hwy. Palmetto Bay, FL 33176. Our associates specialize in residential, commercial, luxury and recreational properties.